bundle-trusty-zabbix.heat.yml: Heat orchestration template. It will be use to deploy the necessary infrastructure. Remember to change the default password immediately after your authentication. Once authentication is complete you will have access to Zabbix-server. accept incoming TCP and UDP communications on the 10050 port, listening port of Zabbix agents by default. A few minutes later, the Zabbix and the Ghost servers’s will contact each other directly. At the moment, it is necessary to make some configuration on the server to monitor. To facilitate you the handling, we prepared you a playbook Ansible which is going to automate these tasks. This playbook will do all the installation and setup on the Ghost server to integrate monitoring on Zabbix server. Congratulation! 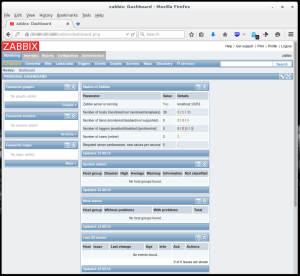 You can view the metric of your zabbix agents monitor by Zabbix-server. There it’s okay… Zabbix stacks can be spawned from our console as well! /var/log/zabbix-server/zabbix_server.log: the directory containing the log.